One of the things that makes Monterey Bay so special is the abundance of sea wildlife that thrive in this area. Home to over 500 different fish, an estimated 180 sea and shore birds, and 34 different marine mammals, there is a lot to see between Ano Nuevo State Park and Point Big Sur. Migration patterns, seasons, different tides, time of day, and the weather can all have an effect on locations for high activity. Here is the short list of some great places where you will rarely be disappointed. The Elkhorn Slough is by far the best place in all of Monterey Bay to check out sea and shore birds. This is because of a 2-mile-deep and 95-mile-long underwater canyon that terminates here. Many fish and invertebrate species follow the canyon to this point and end up being part of the local food supply. The Long Valley and South Marsh Loop Trails will take you through the slough with plenty of view points to check out. Another great spot located at the mouth of the slough is Moss Landing State Beach. 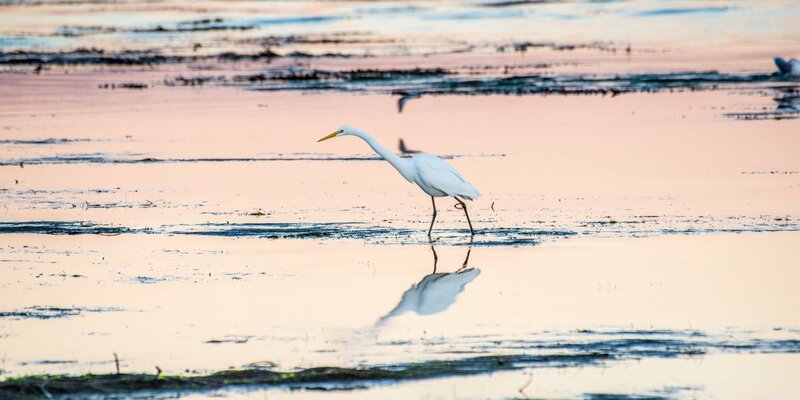 A large mud flat with tons of snowy egrets is in view as soon as you pull in the parking lot. Asilomar State Marine Reserve is located at the tip of the Monterey Bay Peninsula, where the abundance of tide pools and outcroppings provide sanctuary for hundreds of marine animals. This is where the bay meets the open ocean and a different variety of ocean wildlife that do not regularly make it into the bay, such as sharks. You can expect to see cormorants and pelicans by the hundreds here as well as migrating gray whales in the winter and spring. A snowy egret at Pleasure Point. Photo by John Cody. One of the furthest points jutting out into the bay in the city of Santa Cruz is Pleasure Point. This makes a great opportunity to spot whales and other marine life as they cruise the shoreline looking for food. There are a couple of solid spots to see this in action, and the most notable is Pleasure Point Park. You have a great vantage point from the cliffs for whale watching, and birds come to feed in the tide pools during low tide. Not far from Pleasure Point Park is the more secluded Geoffroy Drive. This is also a stellar spot for viewing dolphins, and as an added bonus, it will be a lot less crowded! Another point out into the bay is the always popular Lighthouse Field State Beach. Once again, this is a great spot to catch whales along their migratory path. Dolphins can often be seen swimming among the surfers, especially right after sun rise. Barking sea lions can be heard from here as they like to congregate near the Santa Cruz Wharf. They often come through this point on their comings and goings. 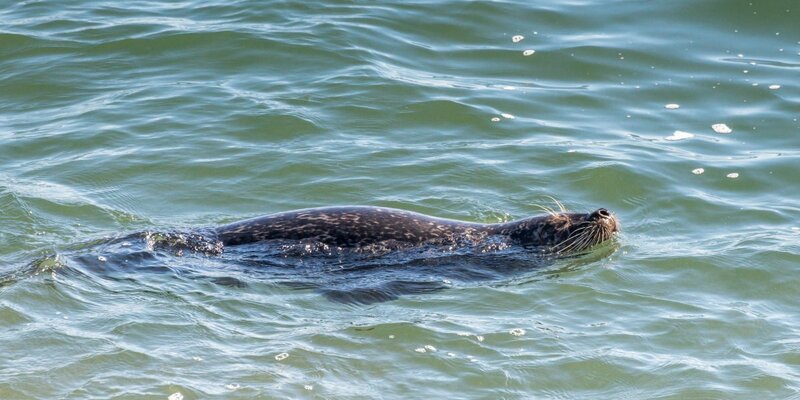 A harbor seal swims off of Seabright Beach. Photo by John Cody. Standing at the head of the jetty protecting the Santa Cruz Harbor is the Walton Lighthouse at Seabright Beach. Not only is it nice to watch the boats come and go from the harbor, a lot of animals like to hang around this point. It is common to see sea lions and otters in the harbor, and on occasion a whale will make it's way in.